From pennies to stickers to donated clothing, Richmond artist and activist Noah Scalin uses the most unexpected materials to highlight important figures in today’s political world. Scalin has created portraits of people he believes deserve recognition – including Ruby Bridges, Maggie Walker, and Martin Luther King. 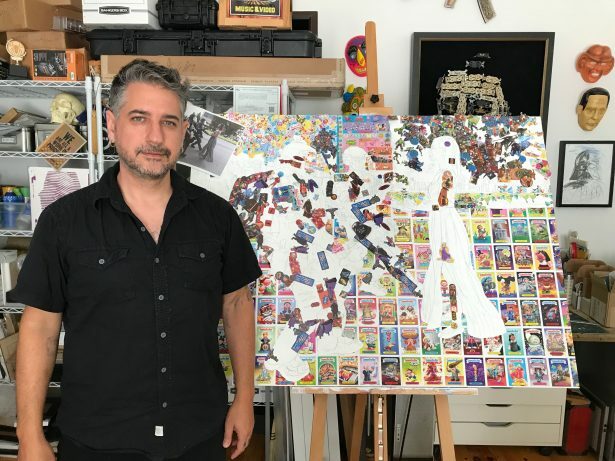 Some of his most popular pieces are made from stickers, where he uses colors and shapes strategically to create faces and scenes. Scalin has also created pieces from sequins, black pepper, buttons, and donated shoes. Scalin’s work focuses on incorporating positive political imagery in a society with ever increasing contentious, defeatist politics. After the 2016 presidential election, Scalin said he wanted to create images that inspire and give people something to look towards. Since President Trump took office in 2016, hate crimes have risen across the nation. With a president whose campaign was rooted in xenophobia and racism–calling Mexicans rapists and proclaiming “Islam hates us” –Scalin’s artwork fights against an administration which has implemented a Muslim ban and condoned the separation of immigrant families at the border. 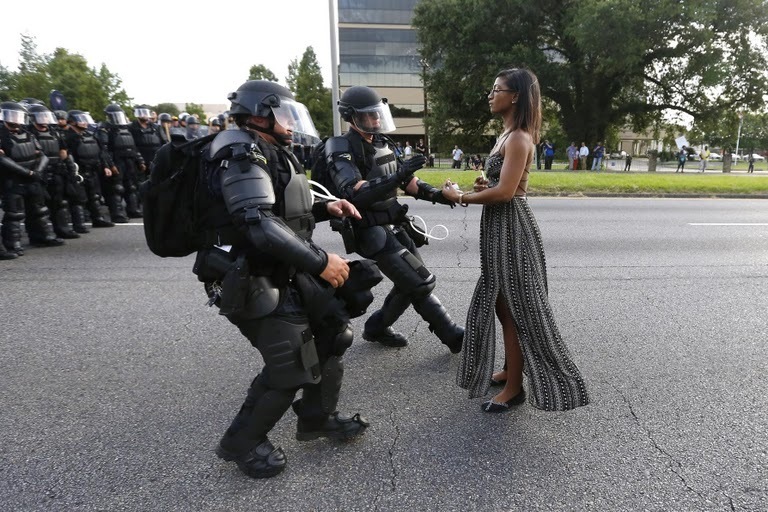 Seeing a strong, powerful activist in Evans, Scalin said he had wanted to create artwork based on this photograph for some time. 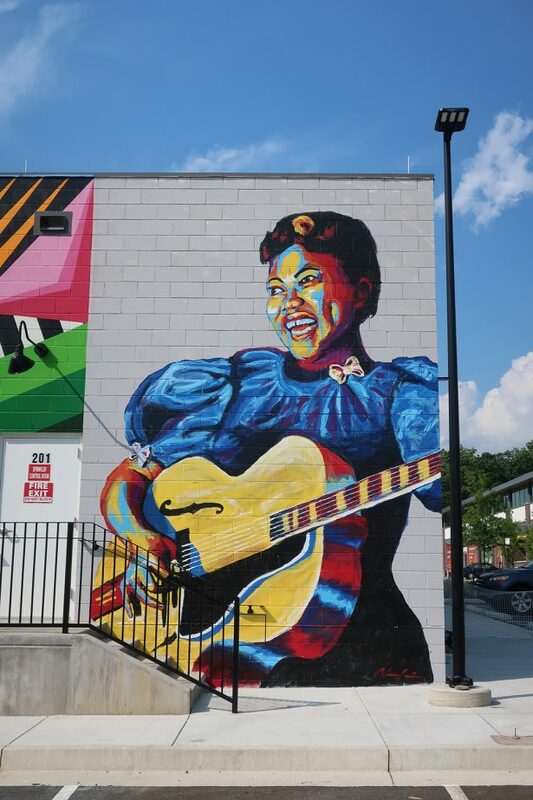 One of Scalin’s most recent installations was a mural for the 2018 Green Gate Festival – where he painted a portrait of Sister Rosetta Tharpe. A queer, black singer/songwriter of the mid-20th century, Tharpe had been hailed the “godmother of rock & roll,” yet receives little acknowledgement today for being a driving force in the birth of rock & roll. Tharpe lived in Richmond for ten years, but Scalin said most of the city’s residents have no idea who she is. 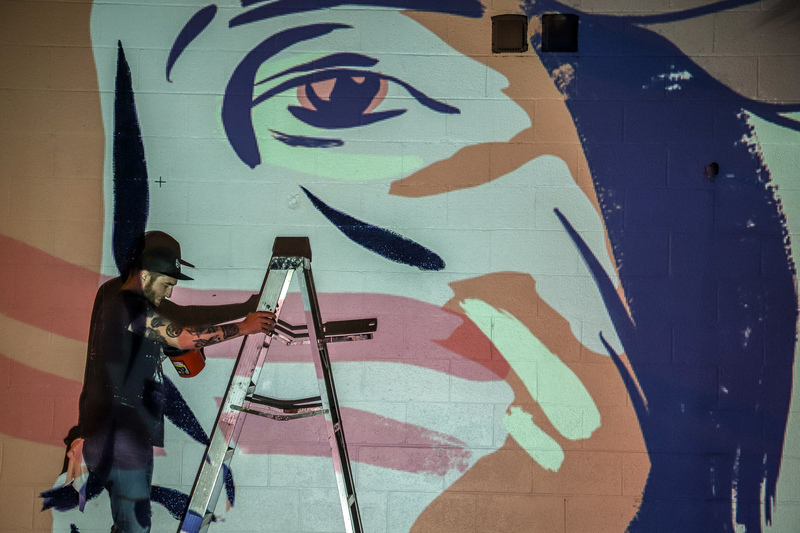 He used his mural for the festival as a chance to highlight her story. Growing up the son of two artists, Scalin said he always knew he was meant to be an artist, too. As an author, activist, and dedicated member of his performance arts band, League of Space Pirates, Scalin has juggled it all. But it wasn’t until his “Skull-a-Day” project in 2007, in which he made a different skull-themed art piece every day for an entire year, that art really became his focus. 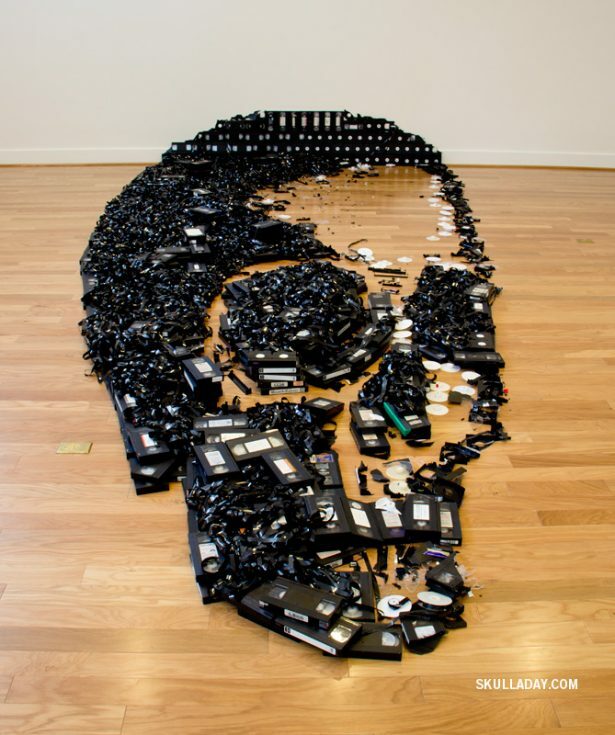 After “Skull-a-Day,” Scalin found the creative energy to start making portraits out of very unconventional materials–everything from CDs to feathers–to make permanent pieces and temporary installations, depending on the materials. Scalin wants his artwork to be as accessible as the items he uses to make them. Scalin said in addition to highlighting positive imagery, he uses unconventional materials to get people to see the world through a different lens. Scalin’s unconventional materials have crossed borders as well, as some of his pieces have ended up in Bali and Indonesia. 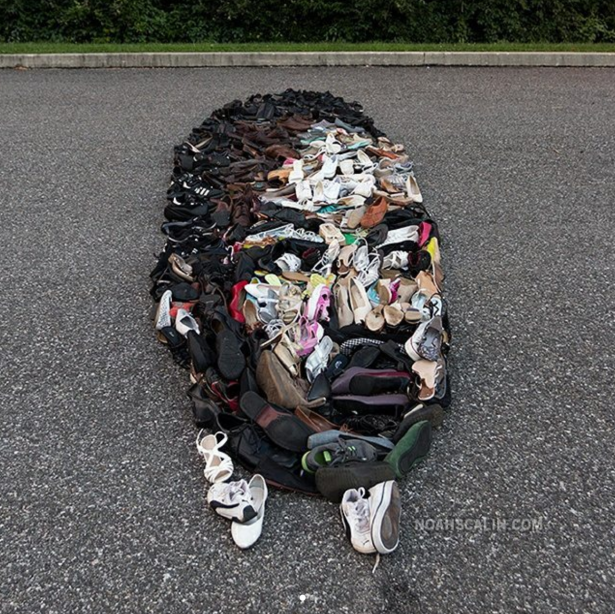 Despite never traveling there, Scalin collaborated with an organization called Micro Galleries, which transforms unused spaces around the world into pop-up, street art installations. The installations and free and accessible to the community, and typically get set up in areas that don’t have much access to artwork otherwise. 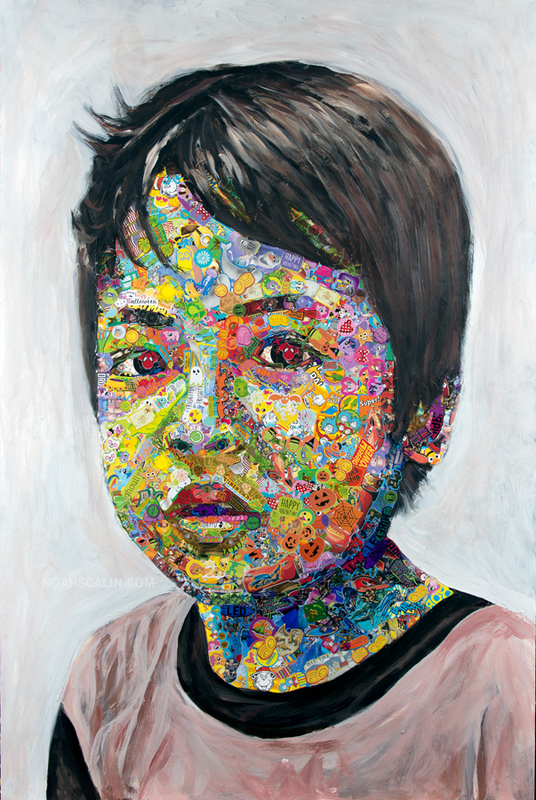 Through collaborating with Micro Galleries, Scalin received a few pictures of neighborhood children who interacted with the pop-up galleries frequently, and decided to make their portraits. 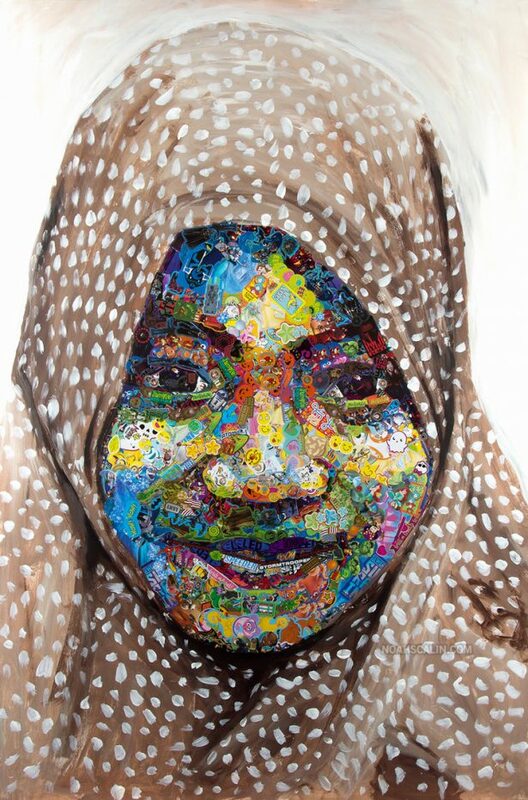 With the help of Micro Galleries organizers, hi-res photographs of the finished portraits were posted up in the children’s hometowns of Denpasar, Bali and Jakarta, Indonesia. Through his work with Micro Galleries, Scalin saw families and children interact with his artwork from thousands of miles away. His interwoven activism and artistry transcends physical borders, creating cross-cultural connections. Photos provided by Noah Scalin. 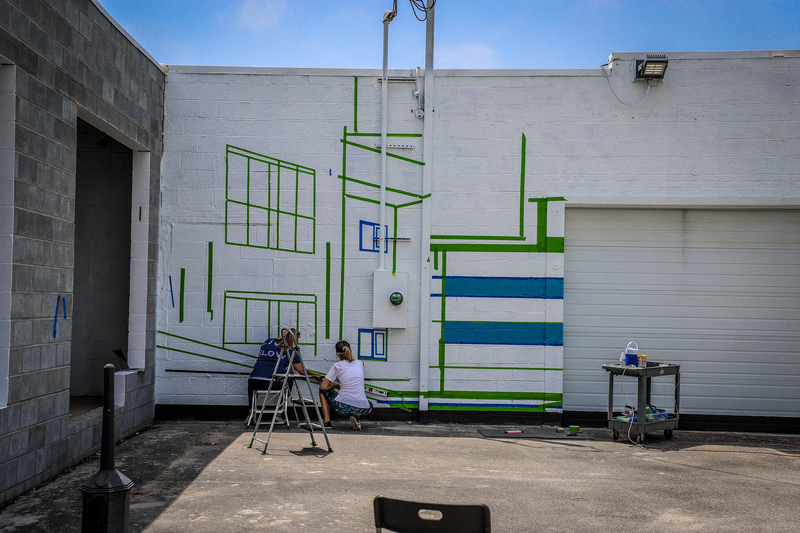 Virginia Beach (VB) kicked off its inaugural mural festival this past weekend in the city’s ViBE Creative District. 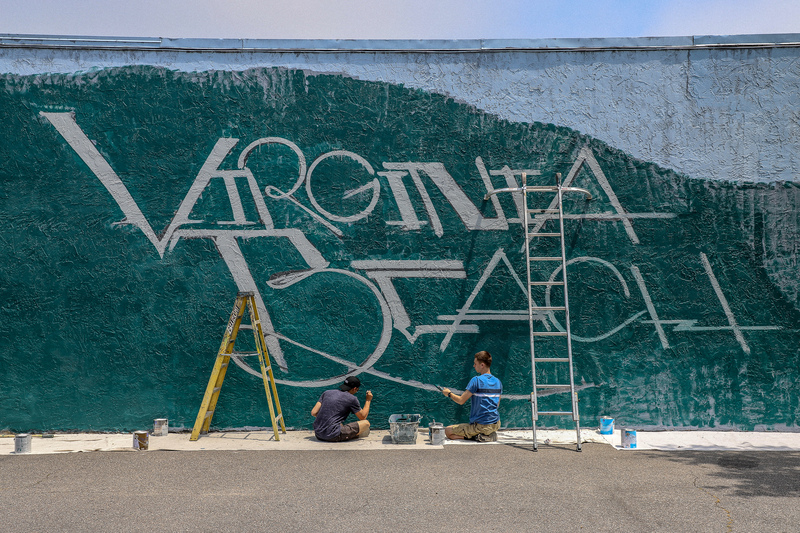 The ViBE, which runs parallel to the oceanfront, has recruited ten artists to paint ten murals over ten days. The festival, sponsored by Towne Bank, has recruited a roster of notable artists from Hampton Roads, Richmond, and from as far away as California and Connecticut. 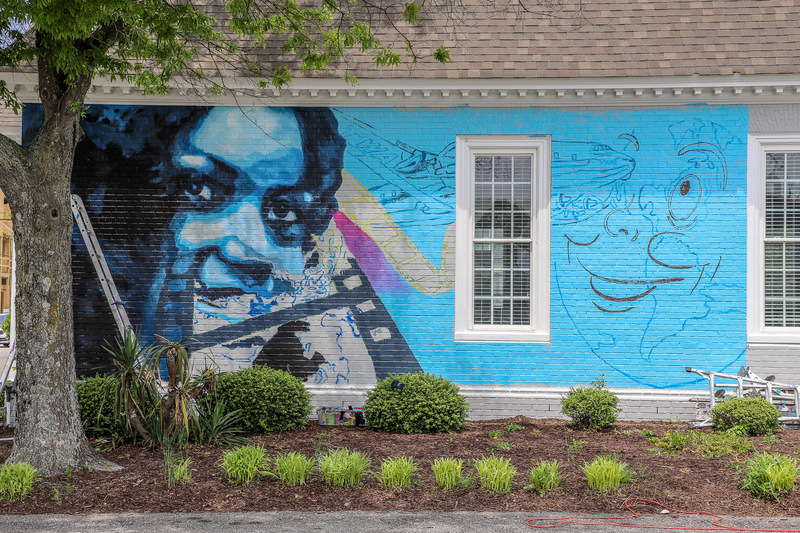 According to the organizers, there were a total of 88 artist submissions from “12 states across the country as well as 10 different cities in Virginia.” The ten property owners selected the mural that would adorn their building from a pool of over 300 submissions. 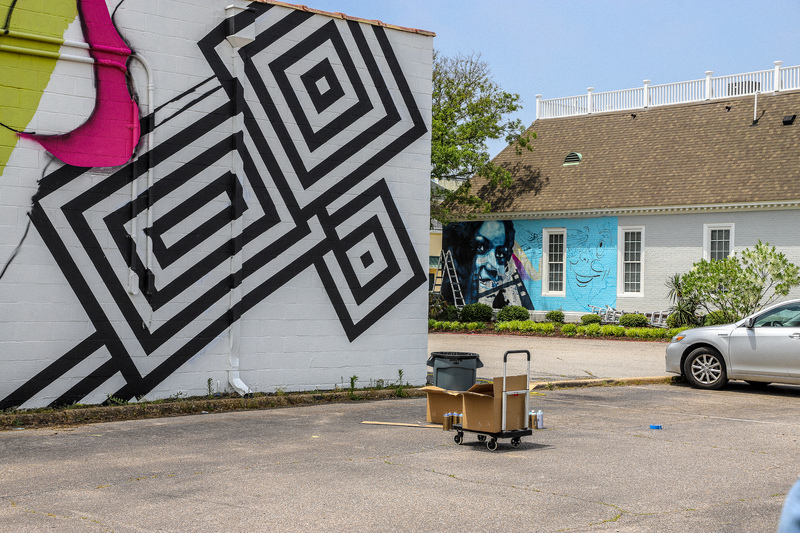 Virginia Beach has a steady arts tradition from the Museum of Contemporary Art to the annual Board Walk Art Show, yet unlike their sister city, Norfolk, there has not been a strong effort to bring wall art to the Resort City until now. And what little wall art there is, has a decidedly military angle to it: planes, soldiers, flags, and service dogs. RVA Mag headed down to Virginia Beach to catch the launch weekend and take the vibe (zing!) of the art going up. 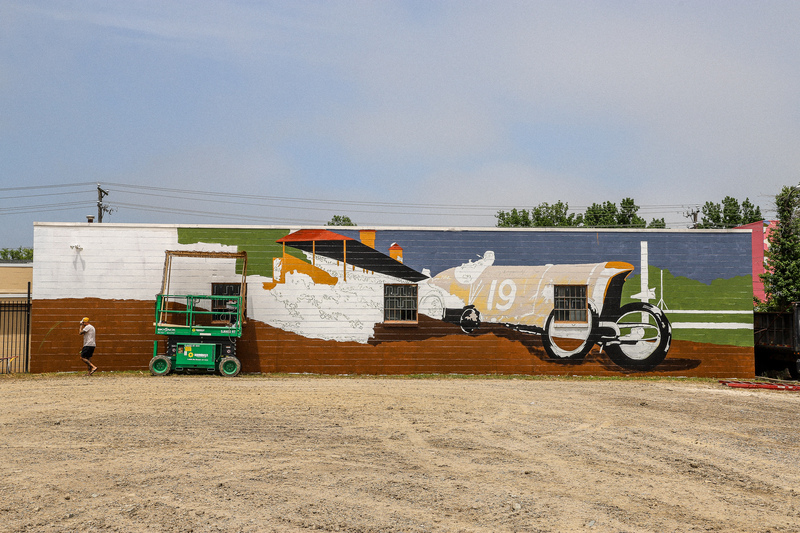 With the ViBE’s mural project in full swing, Virginia has become one of the places to follow for some of the best wall art and murals globally. The Richmond contingent of artists was on full display with notable appearances by Ed Trask, Caesar, Brad Bacon, who was assisting Norfolk artist Charles Rasputin, and former River City artist Tim Skirven. 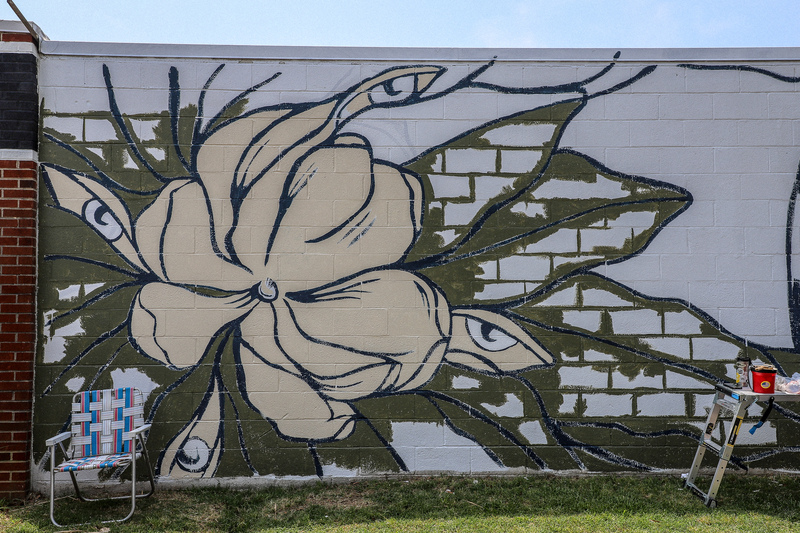 Catching up with Trask, he spoke about how he had been in talks with VB City Council before, sharing his positive experiences from the Richmond Mural Project and how projects like these foster community and local talent. Skirven, who was painting alongside Three Ships Coffee, offered a similar homage, but to Chief Powhatan – the leader of the Tidewater Tribes in the 17th Century. “The mural might be called Spirit Rising,” said Skirven, taking a break from painting at night to speak with RVA Mag. “This is a way to remind people who were here first.” His mural, a magnolia and foliage set against the chief’s visage is also a nod to the original three ships that landed in the Tidewater area and the namesake of the coffee shop it adorns. Growing up in VB, but traveling extensively abroad in Europe and North Africa, this was a chance for him to bring his talent home, saying this was the kind of project he wanted to do when he was younger but never had the opportunity. Some of the artists from outside of Virginia included ARCY from Connecticut and Jeremiah Kille from Santa Cruz in California. “I live on water,” said Kille, who said his background was in shaping surfboards. A natural fit for the surf and beach culture of VB, Kille described his work by saying, “I look at form and composition, hence this design…it is something that is mathematical, all of the pieces of the puzzle coming together.” His piece, which runs perpendicular to Baltic Avenue and sits astride the piece by Trask is an abstract banderole of interlocking shapes set against a constellation of color scapes. One of the most interesting pieces is Art is a Weapon, by Fang Gang’s Charles Rasputin from Norfolk. 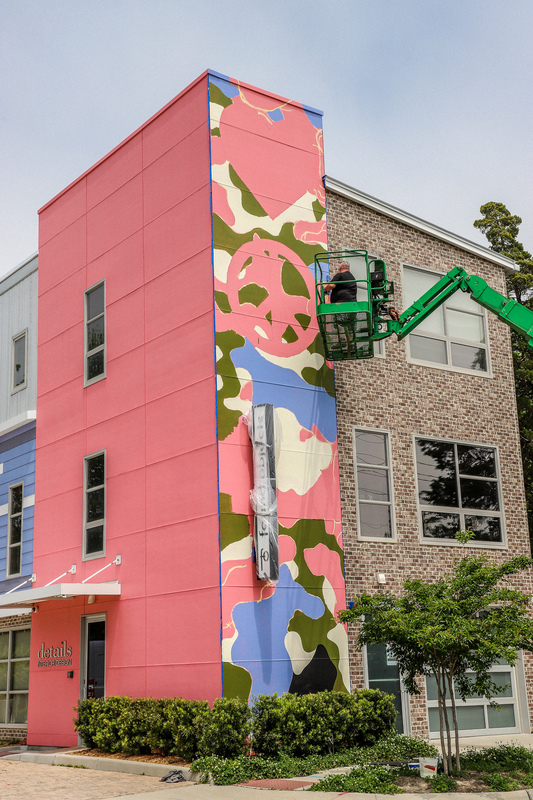 The piece, towering 40 feet into the air, is a camouflage motif of conjoined greens, purples, blacks, and beiges set behind a capacious heart and peace symbol. Taking a break from the 90-degree heat, Rasputin said, “I wanted to achieve something that not only complimented the architecture but stood out visually and carried a strong social statement without being brash or alienating the audience.” He was quick to describe the camouflage pattern as fashion forward, while also bringing a unifying message of love and peace to a city that has an extremely deep military tradition. 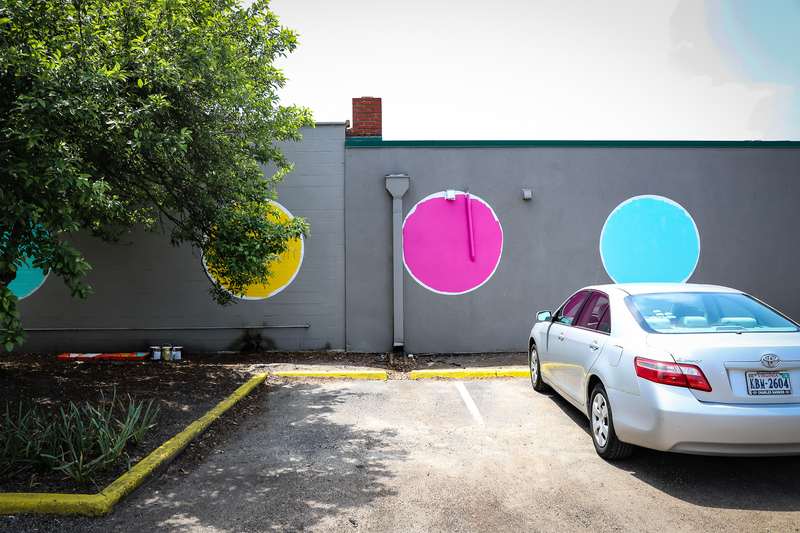 The festival will end next weekend with a closing “parking lot party” on May 19, which will include a question and answer session with the artists from noon on – this will be followed by a walking tour of the murals the next day.